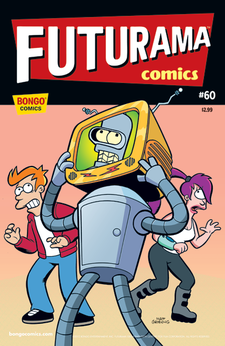 The fable "The Boy Who Cried Wolf"
The Bot Who Cried Wolf is the sixtieth comic issue, released 28 March, 2012 in the US. Bender, Fry and Leela make a delivery to Luna Park and decide to go on a few rides. Bender is unphased by the House of Horrors, but scares the humans with tales of their mortality. Morbo is also in the house and, impressed by his ability to terrify humans, offers Bender a job at Wolf News. 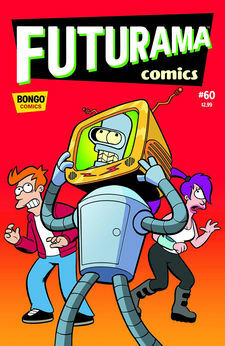 As Bender broke the ferris wheel on his way out, Fry and Leela are roped in by the park's owner to pay off the debt. Bender's first broadcast explains that the world will end the next day and there are riots in the streets. Leela and Fr's jobs are explained and Bender causes another riot on Earth. Leela takes pity on a child and allows her father to win the rigged game and Fry recruits the Professor to make the merry go round more interesting. Bender has Amy on as a guest and makes his audience think she's a bomb leading to another round of riots. The prize given to the child is revealed to be filled with garbage. The park only makes money acting as a garbage dump. Farnsworth has converted the bouncy castle rocket into an actual rocket, which Fry accidentally triggers. It launches, turns around and begins pushing the moon towards the Earth. As Nixon ignores the phone, Fry calls Bender, whose warning goes unheeded. Bender claims to be an Illegal immigrant and that the moon coming towards the Earth has "jillions" more immigrants. Nixon panics and launches missiles at the moon, knocking it back in place and destroying the park. The owner had been planning an accident to claim insurance money, so Fry and Leela are free to go. Bender looses his news job for being an illegal immigrant. Bender: A house of horrors? I haven't used my horror chip since I walked in on Fry using the shower! See ya later, chumps! Bender: What's really scary is how short a lifespan you humans have! All those diseases just waiting to kill you. And that's not counting natural disasters. Add in robot attacks, and you're all lucky to last the week! Fry: I'm in charge of the merry-go-round? That's the slowest, most boring ride! Park Owner: Are you kidding me? It has all the excitement of slowly moving in a circle! Morbo: It's times like this that Morbo is pleased he paid extra and got the high clarity windows for his office. Little girl: I thought my daddy could do anything. Time to lower my expectations of men in general, especially the one I'm going to marry! Professor: Well, what do you think of my new bouncy castle? Fry: I'd say it looks the same, but I don't want you to call me stupid again. Professor: Fry, you're family. I'd never call you stupid. Fry: What's this button do? Professor: Don't touch that, you idiot! The issue's title is a reference to the fable "The Boy Who Cried Wolf". One of Bender's several doomsday predictions refers to the 2012 doomsday predictions. According to James Lloyd, the rioters are loosely based on those at Vancouver's 2011 Stanley Cup hockey riots. Fry makes an obvious reference to the Dr. Seuss book "Green Eggs and Ham", and the background looks similar to the art style used in Dr. Seuss' books while he makes the reference. The end of the world parts of the comic share many scenes similar to the ones in the episode "A Farewell to Arms". The Bongo Beat - Bill Morrison announces his departure from Bongo and reminisces. This page was last edited on 1 September 2015, at 03:00.